The Hybrimune Hybridoma Production System is an advanced electrofusion system for fast, efficient cell fusion in hybridoma production, hybrid cell formation, and dendritic-tumor cell fusions. 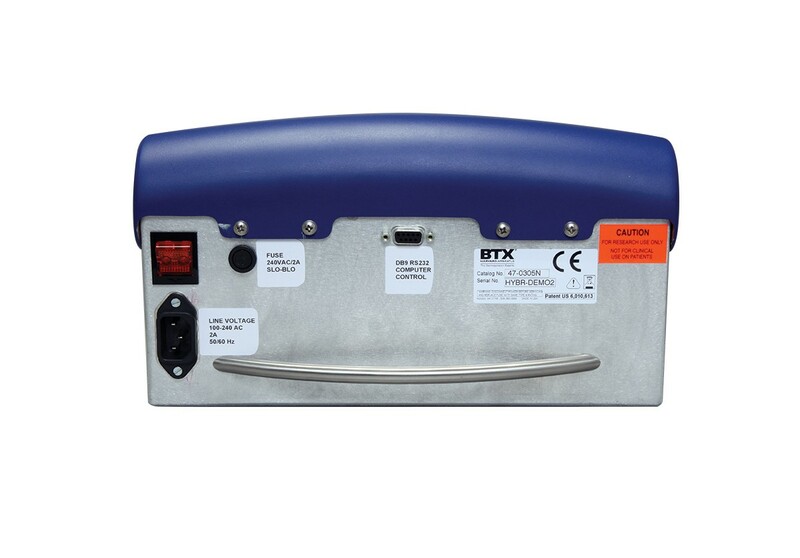 The Hybrimune system includes an innovative fusion chamber design, proprietary BTXpress® Cytofusion medium and sophisticated, tri-phasic electric field pulses that quickly position cells and disrupt cell membranes for maximum cell fusion efficiency with short cycle-times and minimal heating or turbulence for excellent cell viability. In addition, Hybrimune delivers a cell alignment waveform which is a patented sequence that enhances hybridoma yield. The Hybrimune system consists of a user-friendly, programmable waveform generator controlled through the User-Interface Application Software running on a Windows-based computer system (not included). The fusion chamber uses coaxial electrodes designed for optimal electric field stimulation, independent of bath height. In this way, pulse parameters defined with the low volume optimization chamber are directly applicable for the large volume production chamber. The optimization chamber includes a transparent bottom for microscope viewing during the process optimization. 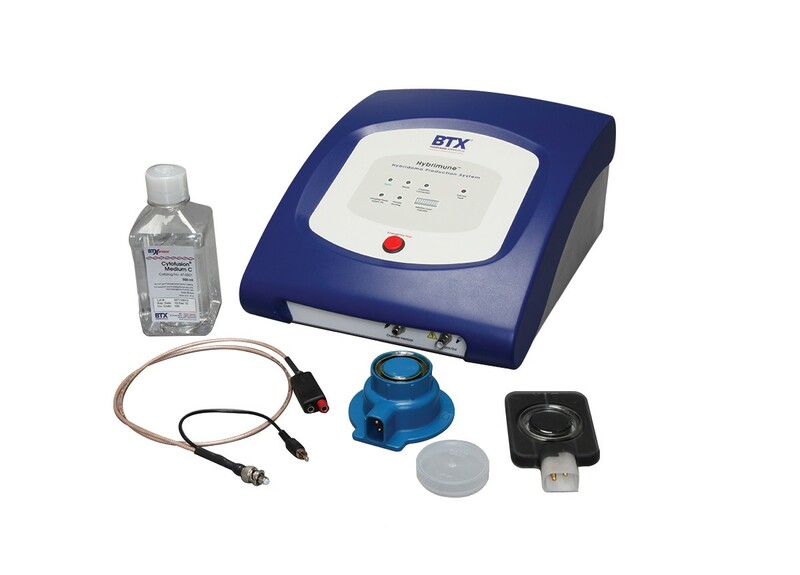 BTXpress Cytofusion medium is a specially formulated, low conductivity solution for robust cell fusion efficiency. 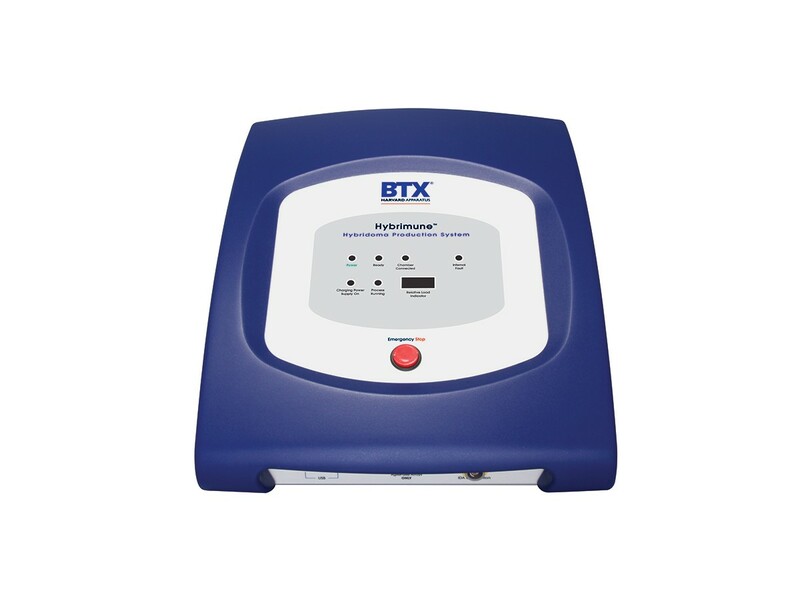 The Hybrimune boasts a gradual increase in AC amplitude to compress the cells for maximal cell-cell contact. The DC pulse is then applied. 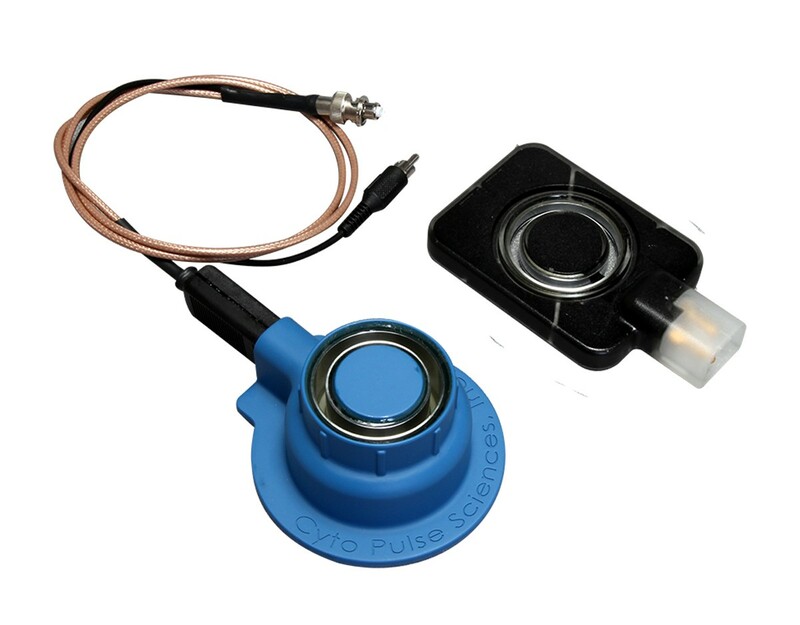 The researcher has the option of doing multiple pulses of different voltages and duration if required. A final AC waveform holds the cells in place and stabilizes the fusion as the force is gradually reduced. 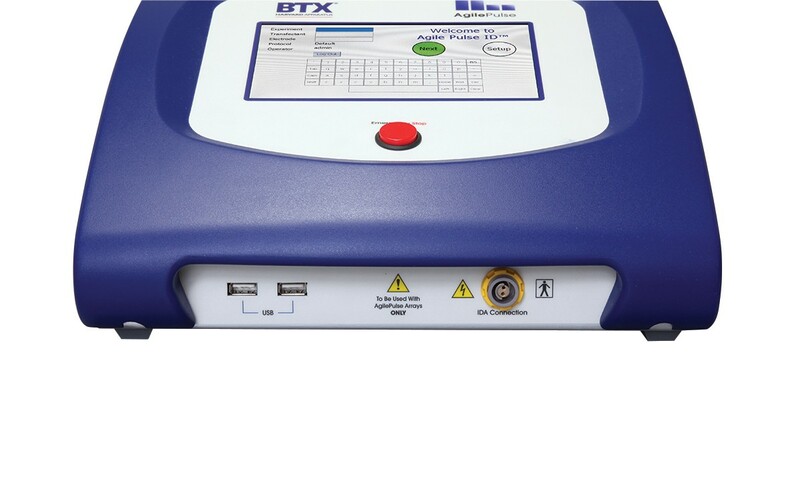 The waveform generator is fully-programmable for pulse parameter optimization to maximize efficiency and cell viability. A computer is required for the application software but is not included in the system. The Hybrimune is intended For Research Use Only. Not for use in diagnostic, pre-clinical, or clinical procedures. Use of the Hybrimune device is subject to an annual license agreement between Cellectis bioresearch and the purchaser. Please contact Cellectis at cytopulse@cellectis.com for further details. The optimization and production chambers have been engineered to have identical electrical characteristics to facilitate direct scale-up to production once pulse parameters have been optimized. In addition the small chamber has a transparent bottom to permit visualization of the cell alignment by inverted or regular microscope. Darveau, A, et al. Efficient preparation of human monoclonal antibody-secreting heterohybridomas using peripheral B lymphocytes cultured in the CD40 system. J Immunol Meth. 1993;159:139-143. James K, Bell GT. Human monoclonal antibody production. Current status and future prospects. Jaroszeski MJ, Gilbert R, Heller R. Detection and Quantitation of Cell-Cell Electrofusion Products by Flow Cytometry. AnalBiochem. 1994;216:271-275. Köhler G and Milstein C. Continuous cultures of fused cells secreting antibody of predefined specificity. J Immunol. 2005 Mar 1;174(5):2453-2455. Larrick, JW, et al. Characterization of human hybridomas secreting antibody to tetanus toxoid. Proc Natl Acad Sci USA. 1993;80:6376-6380. Lee R. et al. A high-throughput hybridoma selection method using Fluorometric Microvolume Assay Technology. J Biomol Screen. 2008;13(3):210-217. Li J, et al. Human antibodies for immunotherapy development generated via a human B cell hybridoma technology. Proc Natl Acad Sci U S A. 2006 Mar;103(10):3557-35662. Lobito AA, et al. An optimized electrofusion-based protocol for generating virus-specific human monoclonal antibodies. J Immunol Methods. 2008 Jul;336(2):142-151. Niedbala WG, Scott DI. A comparison of three methods for production of human hybridomas secreting autoantibodies. Hybridoma. 1998;17:299-304. Neil GA, Zimmerman U. Electrofusion. Methods Enzymol. 1993;220:174-196. O’Shannessy, DJ, et al. Novel antibody probes for the characterization of endosialin/TEM-1. Oncotarget. 2016 Oct;7(43):69420-69435. Schmidt, et al. CD19+ B lymphocytes are the major source of human antibody-secreting hybridomas generated by electrofusion. J Immunol Methods. 2001;255:93-102. Shirahata S, et al. Cell hybridization, hybridomas, and human hybridomas. Meth Cell Biol. 1998;57:111-145. Steenbakkers PG, van Meel FC, Olijve W. A new approach to the generation of human or murine antibody producing hybridomas. J Immunol Methods. 1992;152:69-77. Sugasawara RJ, Cahoon BE, Karu AE. The influence of murine macrophage-conditioned medium on cloning efficiency, antibody synthesis, and growth rate of hybridomas. JImmunol Methods. 1985;79(2):263-75. Trevor K. et al. Generation of dendritic cell-tumor cell hybrids by electrofusion for clinical vaccine application. CancerImmunol Immunother. 2004;53(3):705-714. Vienken J, Zimmermann U. An improved electrofusion technique for production of mouse hybridoma cells. FEBS Lett. 1985;182:278-80. Zhao Q, et. al. A novel function of CXCL10 in mediating monocyte production of proinflammatory cytokines. J Leukoc Biol. 2017 Nov;102(5):1271-1280. Zimmerman U, et al. Generation of a human monoclonal antibody to hepatitis C virus, JRA1 by activation of peripheral blood lymphocytes and hypo-osmolar electrofusion. Hum Antibodies Hybridomas. 1995;6:77-80. Zuchero, YJY, Chen X, Bien-Ly N, Bumback D. Discovery of novel blood-brain barrier targets to enhance brain uptake of therapeutic antibodies. Neuron. 2016 Jan;89(1):70-82.